LTC Carl M. Putnam, January-June 1971. Speech given by LTC (RET) Loel Ewart* at the dedication of the Vietnam section of the Motts Military Museum. Mr. Motts, Distinguished Guests, ladies and gentleman, troopers and ladies. It gives me great pleasure to be with you today and to participate in the opening of the 1st/9th area in the Motts Museum**, and to share with you some of the history of the 1st/9th. The granite foundation of military professionalism is built on 4 legs. Honesty, Integrity, Honor and a deep love of America. This is also the definition of the Cavalry Trooper. Taking its cue from its parent Ninth Cavalry Regiment, known as the Buffalo Soldiers, the 1st/9th was formed in Louisiana, in the 1800’s, and was assigned to the west to protect those settlers heading west from the Indians, and helping to bring law and order to the Old West,. The 1st/9th was also with Teddy Roosevelt at the charge up San Juan Hill. The 1st/9th Squadron has distinguished itself throughout history. The 1stSquadron 9th Cavalry has been a key element of almost all wars, the Indian Wars of the wild west, WW I, WW II, Korea, Vietnam, both Iraq wars and the war on terrorism. All units of the 1st/9th have consistently distinguished themselves both in combat and humanitarian aid missions. The start of the Air Cavalry Squadron began with the formation of the 3rd Squadron, 17th Air Cavalry, a part of the 11th Air Assault Division, formed at Fort Benning, Georgia in 1963, to test the Army’s new air mobility concept using helicopters and light fixed wing aircraft. A mock battle was fought between the 11th Air Assault Division and the 18th Air Borne Core and the 11th Air Assault Division won. This test “locked in Cement “the air mobility concept for the Army. *** assumed command of the 3rd/17th shortly before this test, and called the Squadron, the Bullwhip Squadron. Lieutenant Colonel Stockton led the unit in training at Fort Benning, Georgia and He was known for his no-nonsense, highly professional and innovative approach to flying and fighting. These were traits that endeared him to his troops, because when the time for battle came the troops knew their leader had fully prepared them. LTC Stockton also is the soul person responsible for all Cavalry units now wearing the black cavalry Stetson. This was his trademark during the 11th Air Assault Division test. And several times he was threatened with Courts Marshall if he did not stop wearing it. He not only continued wearing his Stetson, but also had all of his officers wearing the black Stetson. Now you know the story of the modern day Cav trooper and the black Stetson. In July 1965, the 1st Cavalry Division was stood down in Korea and the colors were returned to the states. The colors were reformed into the 1st Cavalry Division (Air Mobile) at Ft. Benning, GA, in July 1965 and the 11th Air Assault Division was changed to the 1st Cavalry Division (Airmobile). The 3rd/17th squadron was re-designated as the 1st Squadron, 9th Cavalry (1/9 Cavalry) With LTC Stockton commanding. On July 18, 1965, President Johnson announced his decision to send the 1st Cavalry Division to Vietnam. Most of the Cavalrymen stayed with the squadron and were joined by new arrivals as they prepared to ship to Vietnam. The 1st Cavalry Division departed the states mid August 65, by boat, in route to the Republic of Vietnam and one month later on 13 September, 1965, LTC Stockton and SGM Kennedy lead the 1st/9th ashore at Qhi Nhon, Vietnam. Those troopers who came over by boat, were commonly referred to as “the Boat People”. Now depending on who said this, it was either an insult or praise, and sometimes the results became rough and tumble. From the time Lt Col Stockton assumed command of the squadron in 1963 until leaving command in late 1965, Colonel Stockton’s radio call sign was Bullwhip. As Commander of the Bullwhip Squadron, Lieutenant Colonel Stockton designed and perfected those air cavalry tactics necessary to support the division with the “eyes and ears” intelligence required to find and fix the enemy and at the same time providing the greatest safety to our own troopers. 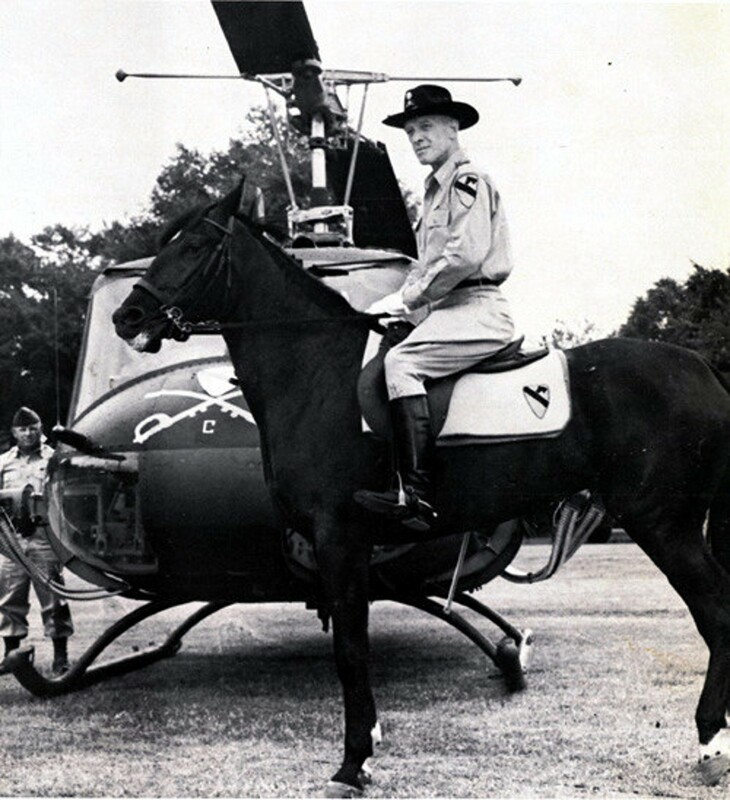 Lieutenant Colonel Stockton has respectfully been called the Father of modern Air Cavalry operations. Lt Colonel Stockton was the prototype squadron commander of the movie “Apocalypse Now.” He was shown smoking a cigar, which he did at times, daring, certainly characteristic, and an aggressive fighter for which there was no equal. Although the battles fought in the movie were not typical of a cavalry squadron, there were great similarities to how the squadron fought its battles – undeterred by obstacles and always moving forward. The 1st/9th Air Cavalry Squadron was the eyes and ears of the 1st Cavalry Division and as such, was called upon to find the enemy for the division. With its 88 aircraft, many flying day in and day out in good and bad weather, the Squadron participated in 13 campaigns and it accounted for more than 50 percent of the enemy killed by the division. It flew more combat hours than any other unit of its size. At the end of the Vietnam conflict there were four Cavalrymen from the squadron who were awarded the Medal of Honor in Vietnam. Many other Vietnam Squadron Commanders followed LTC Stockton and each set his mark on the squadron, continuing the traditions and espirit de corp. that was instilled in the first troops of the 1st/9th. Each following Commander built on, and contributed more to the “no nonsense, can do”, reputation of the 1st/9th. It must also be noted that several Squadron Officers went on to General officer status. General Robert Shoemaker, Major General Michael Nardotti, Major General Jim Smith, Brigadier General David Allen, to name a few. During the Vietnam era, the 1st/9th units included Headquarters, the three air cavalry troops, A. B. C., the ground troop, D, and the two follow on, air cavalry troops, E and F. The Air Cav Troops had 27 aircraft each. 11 gun ships, 6 lift ships and 10 scouts. The ground troop was a full up infantry unit. This was the Squadrons strength. Previously, there had been 18 Medals of Honor awarded to the Squadron throughout its history. And there were four Medals of Honor awarded to the 1st/9th troopers during Vietnam and one Medal of Honor was awarded to a 1/9 Cavalryman in Desert Storm, Iraq. A total of 23 Medal of Honor’s were awarded from the start of the 1st/9th, through Desert Storm, Iraq. At the end of the Vietnam war, the 1/9 Cavalry was the most decorated unit during Vietnam conflict. There were only two combat infantry badges ever awarded to an Army Chaplain. One in World War II and one in Vietnam, and the one in Vietnam was awarded to a Chaplain of the 1/9 Cavalry. Additionally, the fame of the 1/9 Cavalry was recognized by the U. S. Postal service which issued two special stamps in honor of the Squadron. During the Vietnam War from 1965 through 1973, thousands of Cavalrymen — aviators, scouts, infantrymen, door gunners, wrench turning maintenance men, cooks, administrative and staff personnel – served in the 1/9 Cavalry. It is those Cavalrymen of that era who are meeting here today. Many of the Cavalrymen today are wearing black cavalry Stetson hats, some special cavalry caps, all signs of the cavalry tradition. However, most are sporting less than dark hair, and less of it. Some are showing signs of the battles in which they fought. Some will be very emotional at meeting old friends and reliving the times spent in the Cavalry. Others will be telling their wives, or children, or grandchildren about things they never told before. And friends will tell the wives, children, or grandchildren things that they were never told. This day will be an endless time of reliving yesterdays – the good and the good. It must be noted that this, Motts Museum, 1st/9th area and monument, was the brain child of Edward Arthur, and was made possible by the almost single handed dedication and hard work of Edward Arthur, assisted by Robert Griffin. Without these two, this would not have happened. Everything you see today is by donations from the rank and file, 1st/9th troopers. I look out at you and I see my brothers, steeled in combat, dedicated, loyal men, and I am proud to call all of you, my brother. You are the hero’s of the Vietnam era. We have stood fast, and lived by the Squadron motto of “We Can, We Will” and we can proudly say, “We Did”! May God keep you in the palm of his hand and watch over each and every one of you, and you families. * LTC Loel Ewart served in the 1st Squadron 9th Cavalry Regiment 1965-1966 in Vietnam. ***John B. Stockton was born on November 7, 1922 and died August 7, 1997. My name is Frank Mckinnon. I was in Vietnam Feb. 14, 1969 until Feb. 14 1970. I did not know LTC Stockton, but I did know the rest. Our 1968 model UH-1H, was number 15658. It first was LTC Peterson’s bird for a short while, then LTC Booth, LTC Covington, until he was WIA, then LTC Booth came back. Last, but not least of the commanders I knew was, LTC Burnett. I was their crewchief. And I can tell you these men were all great and courageous commanders. When we were departing the AO at the end of the day, and if we lost men in the field that day, all these men were silent and humbled all the way back in. I felt their anguish from the back seat for the fallen troopers, and their familes. I have raised four children of my own, and our family has been successful at business. But my memory never wonders very far before finding its way back to these commanders, and my experiences with them. I just wanted to say thank you very much for allowing me to do my small part. And that it was a great honor to be your crewchief. Frank McKinnon.. HQ troop, 1st of the 9th. air cav. Phuoc Vinh. South Vietnam. The battle of the IA Drang was fought by both the 1/7th and the 2/7th Cavalry. However, the 1/9 Cavalry did a recon of the area prior to the 1/7th going in and told the brass not to send them because there was a large size enemy force there. Charlie Troop 1/9th lost at least three men in the Ia Drang prior to the 1/7th going in. Know all of your facts before you comment.